Military officials have confirmed an F-35B has crashed in South Carolina near the Marine Corps Air Station Beaufort but the pilot was able to safely eject. The pilot is currently being checked by medical personnel, Marine spokesman Capt. Christopher Harrison said. The crashed F-35B belonged to 2nd Marine Aircraft Wing, Marine Fighter Attack Training Squadron 501, known as the "Warlords." Capt. 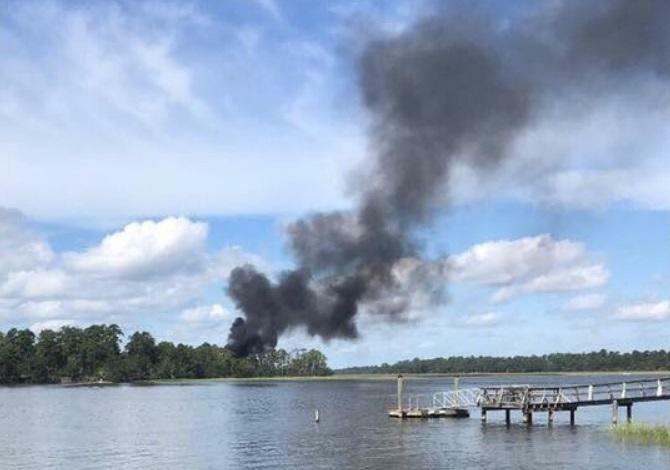 Harrison added, "Marines from MCAS Beaufort are working with local authorities currently conducting standard mishap operations to secure the crash site and ensure the safety of all personnel in the surrounding area." He also confirmed no civilians had been injured by the crash. The crash was first reported by Defense News who said the Marine air base at Beaufort, South Carolina has been training new pilots for the high-tech stealth fighter. Problems have arisen from the lack of spare parts and the jet's logistics system which hasn't been perfected. Some of the $90 million dollar F-35s sit for extended periods of time waiting for spare parts through the Autonomic Logistics Information System. The delivery of expected spare parts from ALIS projects is sometimes as far as two years out, according to Defense News. The F-35 marked its first combat strikes in Afghanistan yesterday according to Military Advisor on Twitter. The Townsend Bombing Range in Georgia is just 82 miles southwest of the Beaufort airbase and is currently being expanded to accompany modern F-35B training. The base has been modernized so F-35B pilots can train with precision-guided munitions. A Marine F-35B was forced to make an emergency landing at Cherry Point, North Carolina earlier this year in April. That forced landed was prompted by leaking fuel. The cause of Friday's crash is still under investigation. The F-35B is one of the most advanced fighter jets available on today and is perhaps most recognizable for its ability to take-off and land vertically. To see the jet perform this maneuver looks like something fictional as it seems just to defy gravity. The best scam the military private sector can give! thank you for covering the news , hope the pilot is in good health , and that plane gets a through investigation upon it .. there has been way to many airplane accidents for a long time both passenger and jets , private planes and helicopters etc. perhaps patents on parts may have some errors that could be of concern, verse all the regular news responses of error from this or that… same goes for digital components used nowadays.. reading the many news articles within the G W ater news..